This is the first in a five-part series covering the impact of Augmented Reality on the transportation and logistics industry. and global economies that are increasing driven by ecommerce transactions that require delivery of goods directly to the homes of consumers. Meeting these challenges is also complex, as the transportation and logistics sector covers a vast array of businesses. And it’s huge. Logistics services – such as inbound and outbound transportation management, fleet management, warehousing, materials handling, order fulfillment, logistics network design, inventory management, supply and demand planning, third-party logistics management, and other support services. Air and express delivery services (EDS) – Rated by SelectUSA as an $82 billion industry in the United States alone, it also provides “the export infrastructure for many exporters, particularly small and medium-sized businesses that cannot afford to operate their own supply chain”. Freight rail – The United States boasts a 140,000-mile rail network network that SelectUSA says delivers an average of 5 million tons of goods and serves “almost every industrial, wholesale, retail, and resource-based sector of the economy” – including more than 70 percent of the nation's coal (5.2 million carloads), about 58 percent of its raw metal ores, 1.6 million carloads of wheat, corn, and other agricultural products, and 13.7 million "intermodal" containers and trailers that transport consumer goods. Maritime – This sub-sector includes carriers, seaports, terminals, and labor involved in the movement of cargo and passengers by water. SelectUSA says it moves the predominant share of U.S. international merchandise trade, including 76 percent of U.S. exports by tonnage. Trucking – Probably the most high-profile component of the logistics and transportation, trucks move cargo over short and medium distances. According to the American Trucking Associations, trucking revenues were $676.2 billion in 2016 (the all-time record of $719.3 billion was in 2015), while trucks moved more than 10.4 billion tons of freight. Needless to say, this is a massive, complex and tightly integrated sector of the economy – and it plays a vital role in the work of almost every other business. It’s hard to think of an enterprise that doesn’t depend on transportation and logistics companies to fulfill some vital function in its business. According to a recent report by strategy and analysis firm PwC, technology will play a big factor in the evolution of transportation and logistics as it works to meet the many challenges it faces. One of the key concepts in the PwC report is the idea of developing a “Physical Internet” that mirrors the digital internet that underpins much of our work today. The Physical Internet (or PI) is a concept first articulated by Dr. Benoit Montreuil, who is the Coca-Cola Material Handling & Distribution Chair in the Stewart School of Industrial & Systems Engineering at Georgia Tech. He is also Director of the Physical Internet Center and a leader of the Supply Chain & Logistics Institute – and has been a champion of the idea that the way information moves around on the “digital internet” should be the model for a new “Physical Internet” that will underpin the future of global logistics and manufacturing. In its report, PwC explains that the Physical Internet “is based on the idea that physical objects can be more efficiently moved around if they become more standardized and share common channels, like data packets on the internet”. The report also suggests that achieving the goal of a PI will require modular components as well as and standard interfaces and protocols. “In addition, hubs and networks across transport modes will need to be better synchronized, and IT applications and networks will also need to operate together,” it concludes. 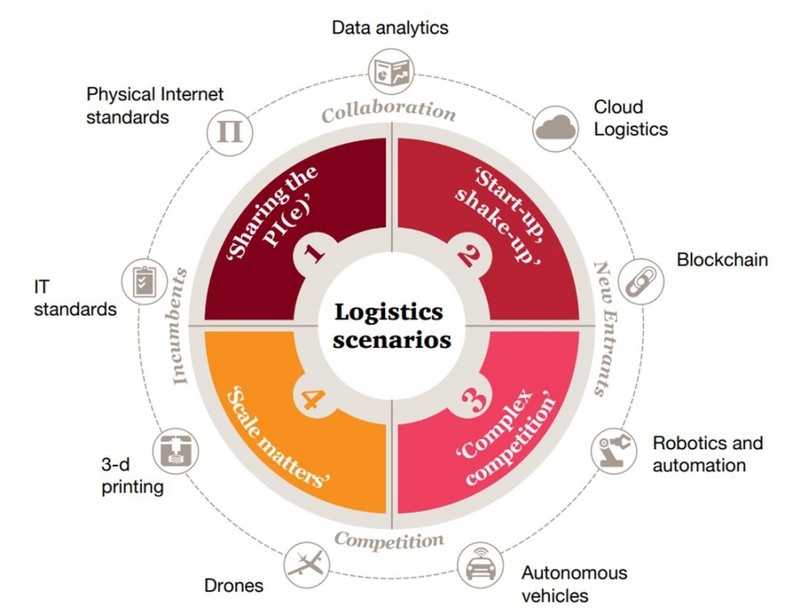 In the next part of this series, we will look at how PwC and other industry analysts look at some of the technologies represented in the diagram above – and drill down into the business issues facing one specific part of the sector – trucking – and how some of those business issues can be addressed through the use of Augmented Reality technology.